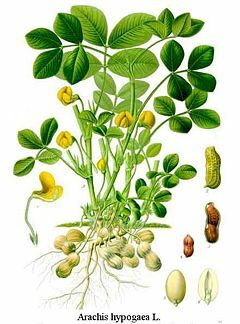 The peanut or groundnut (Arachis hypogaea) is a member of the legume family (Fabaceae), along with beans and peas, and is an important food crop. This species is native to South America. Although the fruit of Arachis hypogaea is considered a “nut” in the culinary sense, in the botanical sense, the fruit of the peanut is a woody, indehiscent legume or pod and not a true nut. A true nut (acorn, chestnut) is a simple dry fruit with one seed (rarely two) in which the ovary wall becomes very hard (stony or woody) at maturity and does not split along a definite seam. A seed, such as a peanut, comes from fruit and can be removed from the fruit. A nut is a compound ovary that is both the seed and the fruit, which cannot be separated. As they have done with other plants, humans have taken the rich diversity in creation and added their own creativity, developing thousands of unique cultivars of peanuts (different named varieties of the plants) and numerous means of preparation for consumption or other uses. As with other legumes, Arachis hypogaea has a mutually beneficial symbiotic relationship with nitrogen-fixing bacteria, allowing atmospheric nitrogen to be converted into a form useable by plants, a feature that farmers have found useful in replenishing nitrogen-poor soils. Peanuts are also known as earthnuts, goobers, goober peas, pindas, jack nuts, pinders, manila nuts, and monkey nuts. The peanut plant is an annual herbaceous plant (a plant grown for culinary, medicinal, or in some cases even spiritual value), growing to 30 to 50 cm (1 to 2 feet) tall. The leaves are alternate, pinnate with four leaflets (two opposite pairs; no terminal leaflet), each leaflet 1 to 7 cm (0.33 to 2.75 inches) long and 1 to 3 cm (0.33 to 1 inch) broad. The pods begin in the orange-veined, yellow-petaled, pea-like flowers, which are borne in axillary clusters above ground. Following self-pollination, the flowers fade. The stalks at the bases of the ovaries, called pegs, elongate rapidly, and turn downward to bury the fruits several inches in the ground to complete their development. When the seed is mature, the inner lining of the pods (called the seed coat) changes color from white to a reddish brown. The entire plant, including most of the roots, is removed from the soil during harvesting. The pods act in nutrient absorption. The fruits have wrinkled shells that are constricted between the two to three enclosed seeds. The mature seeds resemble other legume seeds, such as beans, but they have paper-thin seed coats, as opposed to the usually hard legume seed coats. Peanuts grow best in light, sandy loam soil. They require five months of warm weather and an annual rainfall of 500 to 1000 mm (20 to 40 in.) or the equivalent in irrigation water. 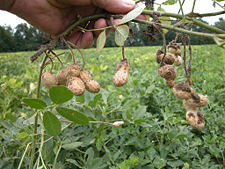 Peanut plants are resistant to both drought and flooding (University of Georgia 2006). The peanut was first cultivated in prehistoric times in South America (perhaps in Brazil, Bolivia, or Argentina), where wild ancestors are still found. Cultivation spread as far as Mesoamerica where the Spanish conquistadors found the tlalcacahuatl (Nahuatl for "earth cacao" or peanut, hence in Mexican Spanish, cacahuate) being offered for sale in the marketplace of Tenochtitlan (Mexico City), as they are still offered by street vendors there today. The cultivation of peanuts spread around the world after the European discovery of the New World. In Africa, they became popular early and from there they were brought through the slave trade to what is now the southeastern United States. Before the American Civil War, peanuts in the United States were mainly grown and eaten by black Southerners as a garden crop. (One name for them, "goobers," comes from an African word). During the Civil War, the shortage of food in the South led to peanuts becoming more commonly eaten by white Southerners and also by Union soldiers. After the war, peanut cultivation was encouraged to replenish the soil, which had been depleted of nitrogen by years of cotton cultivation. George Washington Carver was one of the peanut's leading advocates. During the twentieth century, peanuts steadily became more popular as a food, especially with the development of modern shelf-stable peanut butter by Joseph L. Rosefield in 1922, and are now one of America's favorites. 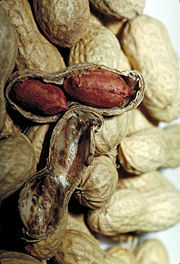 Although it has been suggested that a now unknown Old World species of peanut was cultivated in China from prehistoric times, the New World peanut seems to have been introduced there by Portuguese traders in the 1600s (University of Georgia 2006) and another variety by American missionaries in the 1800s. They became popular and are featured in many Chinese dishes, often being boiled. During the 1980s, peanut production began to increase greatly so that by 2006, China was the world's largest peanut producer. A major factor in this increase has been China's move away from a communist economic system toward a more free market system so that farmers are free to grow and market their crops as they decide (Yao 2004). The Government of China does not control or intervene in peanut production or marketing. It does not provide subsidies, either direct or indirect. As an indication of the government’s lack of involvement in the peanut industry, China’s Ministry of Agriculture (MOA) did not even mention peanuts in its May 2003 report in which it outlined its strategic development plan for major crops (Butterworth 2003). Today peanuts are grown in almost 100 countries. The largest producers are: China, India, Nigeria, the United States, Indonesia, and Sudan (ICRISAT). 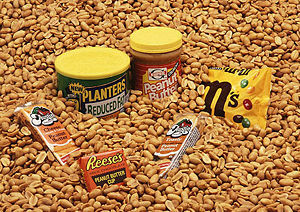 In the United States, peanuts are mainly used directly for food with about half the crop turned into peanut butter. In other countries, they are mainly grown for the extraction of oil. Worldwide, 50 percent of peanut production is used for oil extraction, 37 percent for direct food uses, and 12 percent for seed purpose (ICRISAT). Peanuts are the thirteenth most important food crop of the world. They are the world's fourth most important source of edible oil and third most important source of vegetable protein (ICRISAT). They contain high quality edible oil, easily digestible protein, and carbohydrates. Peanuts are a significant source of resveratrol, a chemical compound that is reported to have a number of beneficial health effects, such as anti-cancer, antiviral, neuroprotective, anti-aging, anti-inflammatory, and life-prolonging effects. Peanuts are found in a wide range of grocery products. Peanuts have a variety of industrial uses. Paint, varnish, lubricating oil, leather dressings, furniture polish, insecticides, and nitroglycerin are made from peanut oil. Soap is made from saponified oil, and many cosmetics contain peanut oil and its derivatives. The protein portion of the oil is used in the manufacture of some textile fibers. Peanut shells are put to use in the manufacture of plastic, wallboard, abrasives, and fuel. They are also used to make cellulose (used in rayon and paper) and mucilage (glue). Peanut plant tops are used to make hay, which is rich in protein and has better palatability and digestibility than other fodder. The protein cake (oilcake meal) residue from oil processing is utilized as an animal feed and as a soil fertilizer. Peanuts are particularly susceptible to contamination during growth and storage. Poor storage of peanuts can lead to an infection by the mold fungus Aspergillus flavus, releasing the toxic substance aflatoxin, which can cause liver damage and cancer. The aflatoxin-producing molds exist throughout the peanut growing areas and may produce aflatoxin in peanuts when conditions are favorable to fungal growth. Some people have severe allergic reactions to peanuts. For people with peanut allergy, exposure can cause fatal shock. For these individuals, eating a single peanut or just breathing the dust from peanuts can cause a fatal reaction. An allergic reaction also can be triggered by eating foods that have been processed with machines that have previously processed peanuts, making avoiding such foods difficult. Because of their concern for people with peanut allergy, many airlines have stopped serving peanuts on flights, which used to be traditional, and some schools have banned peanuts from students' lunches. From 1946 to 1951, the British government tried to plant peanuts in Tanganyika (now part of Tanzania). This was called the Tanganyika groundnut scheme. Among other reasons, the scheme was unsuccessful because the ground was clay-like and hardened after the end of the rainy season, making harvesting the peanuts impossible. Butterworth, J., and X. Wu. 2003. China, Peoples Republic of: Oilseeds and Products. USDA Foreign Agricultural Service GAIN Report. International Crops Research Institute for the Semi-Arid Tropics (ICRISAT), "Groundnut (peanut)" . Putnam, D. H., and E. S. Oplinger. 1991. Peanut. St. Paul, MN: Center for Alternative Plant and Animal Products, University of Minnesota . University of Georgia. 2006. World Geography of the Peanut . Yao, G. 2004. Peanut Production and Utilization in the People's Republic of China. University of Georgia. This page was last modified on 3 April 2008, at 23:56.